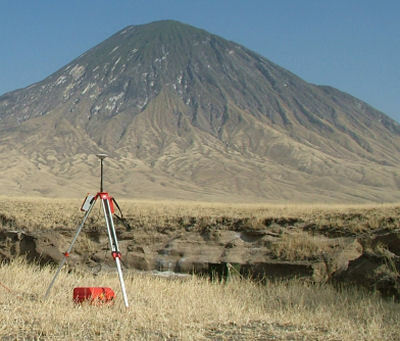 Thirty-eight Young Explorers recently took part in a scientific expedition to Tanzania where they used Leica Geosystems’ equipment to carry out survey and geosceintific measurements of the active volcano, Ol Doinyo Lengai. 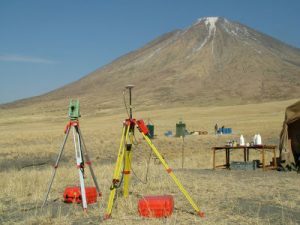 The students, part of the BSES Expeditions, completed a gravity survey using Leica GPS530 receivers, as well as a digital terrain model of the volcano crater and height measurements using the new Leica TPS1205. Africa’s Great Rift Valley has many spectacular sites. In the Grogory Rift south of Lake Natron in northern Tanzania is a unique active volcano. Ol Doinyo Lengai, which means The Mountain of God in Maa, the language of the Maasai who live in this desolate region, is up against the western wall of the Rift, and towers above it. It is unique because it is the only volcano in the world that erupts natrocarbonatite lava. This looks like very fluid black oil, but rapidly turns white as it absorbs water. In the dry season this can happen over a few days, but in rainy weather the lava turns white immediately. This can give Ol Doinyo Lengai the appearance of being snow capped. 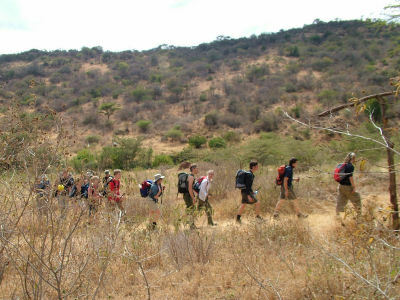 Trekking up Longido as a warm up to the trek across the floor of the Rift Valley. At two o’clock in the morning on 19th July 2004, 38 Young Explorers, with nine Leaders arrived at their camp site in the shadow of Longido some one hundred kilometres to the east of Ol Doinyo Lengai. These Young Explorers were a BSES expedition who would walk across the savannah on the floor of the Rift Valley to Ol Doinyo Lengai then climb its steep flanks before trekking across the Crater Highlands to mankind’s birthplace at Oldupai Gorge on the edge of the Serengeti plains. BES Expeditions (formerly ‘The British Schools Exploring Society’) came into existence in 1932 from an educational idea by Commander George Murray Levick RN, a member of Captain Scott’s final Antarctic expedition of 1911 to 1912. BES Expeditions aim is to deliver a once-in-a-lifetime experience that is both challenging and fun and to develop essential skills in each of the Young Explorers taking part including leadership, communication and teamwork skills that will help them in the future. The aim of BES Expeditions is “To provide young people with an intense and lasting experience of self-discovery in a demanding and natural wilderness environment”. Although exploration is a key part of such an expedition, BSES also involve the Young Explorers in scientific activities. Aged between 16 and 20, although most were on the younger side, these Young Explorers were are divided into three Fires, a Fire being a group of a dozen or so Young Explorers with two Leaders, a good number to sit round a camp fire! The largest Fire concentrated on the Ecology of the region and their prime objective was to study the diversity of vegetation and birds across the Rift Valley and due to altitude on Ol Doinyo Lengai, the active volcano and an extinct volcano near by, Kerimasi. Gravity Meter readings with the position and height being fixed using the Leica SR530 GPS. The two other Fires were Geoscience and Survey whose their activities were closely related. 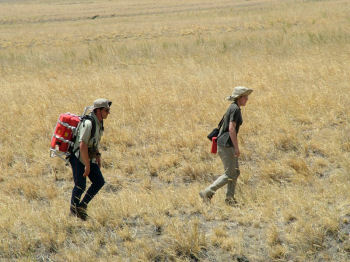 The main task for the Geoscience Fire was to carry out a Gravity survey during the trek across the Rift Valley and on the slopes of Ol Doinyo Lengai. The need for accurate heights provided the Survey Fire with one its the two main science tasks. The Gravity meter measures the pull of gravity and the last count on the dial is equivalent to a mere 0.03m in height, although accurately reading this is extremely tricky, so we needed to achieve relative heights between successive gravity reading of better than 0.1m. In order to achieve this requirement Leica GPS530 receivers were used in differential mode. Four primary locations were occupied for up to 12 hours and these were computed as base lines back to the IGS (International GPS Service) Station at Malindi on the Kenya coast, with checks to IGS Stations at Mbarara in Uganda and in the Seychelles. These provided bases from which differential GPS observations were taken for each location of readings with the Gravity meter. Leica GPS SR530 receivers proved their worth in this harsh environment and worked faultlessly throughout the expedition despite the heat and dust and being used by inexperienced people. Using check bases and closed traverse we were able to establish that the precision of the results were better than 0.1m in both plan and height with many of the points showing much better results than this, so we achieved our goal in an efficient manner. During the course of the expedition the Leica SR530 receiver, aluminium tripod and gravity meter were backpack packed to some very difficult locations. Not only was it taken to the top of Ol Doinyo Lengai and used to traverse down its precipitous flanks but it was also taken up the western wall of the Rift Valley to the complete the gravity traverse across the valley floor. Backpacking the Leica SR530 GPS across the savannah. Hanna is in front with the battery and Colin follows with the Leica SR530 GPS. 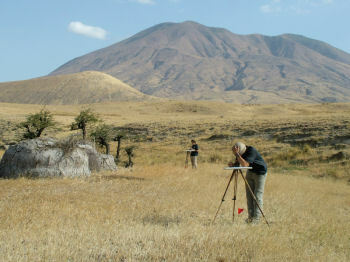 The other major science project carried out by the Survey Fire was to produce a Digital Terrain Model (DTM) of the active crater of Ol Doinyo Lengai. The ideal Instrument for this was the newly launched TCRP1200 with its long-range Reflectorless measurement capabilities. A TCRP1205 and lightweight Aluminium Tripod were backpacked up the very steep path to the crater on the summit of Ol Doinyo Lengai. A strenuous climb of some 2000m in altitude so the light weight of this Instrument was a blessing. This Instrument also worked faultlessly in the harsh environment found in the crater of an active volcano again despite being used by inexperienced people who achieved excellent results after only a short lesson in its operation. The new batteries proved to be a major benefit. Not only were they very light so did not add much to the heavy loads of water and food that needed to backpacked to the top to sustain those staying up there and carrying out the survey observations, but their long levity meant that they did not need continually bringing down, recharging and taking up again, and when they did need charging it did not take long minimising the intrusion of a generator running at base camp. GPS Base Station at the camp at the base of Ol Doinyo Lengai. Another task performed by the Survey Fire were to determine the height of Ol Doinyo Lengai by accurate measurements using the TCRP1205 to a point established using the Leica SR530 receiver relative to the IGS Station at Malindi. Our last camp on the rim of Ngorongoro Crater. 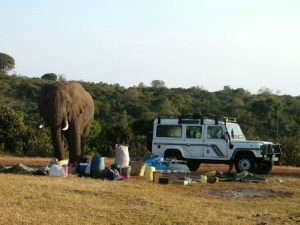 This is a wild elephant helps himself to the camp supplies. This has to be the most accurate determination of the height of this mountain ever made, but its value could become superfluous next time Ol Doinyo Lengai erupts. We established that the summit of Ol Doinyo Lengai has an Orthometric Height (height above mean sea level) of 2951.6 metres whilst the GPS, or Ellipsoidal, Height was established as 2962.2 metres. This exercise fits in neatly with the use of Leica SR530 GPS receivers to determine the height of nearby Kilimanjaro as reported in Reporter 44. The team also took advantage of the GPS measurements to compare the accuracy of a Navigated GPS solution compared to the Computed result. Being close to the equator there was good GPS satellite coverage thought the expedition and the results showed that the Navigated positions made with the Leica SR530 receivers were within 5 metres of the computed position in plan and 10 metres in height, although the majority were within 5 metres in height, whilst the Navigated positions provided by the small hand held Garmin eTrex receivers were within 15 metres in plan, but up to 75 metres different in height. Camilla and Ben Plane Table Surveying around Kerimasi Base Camp. 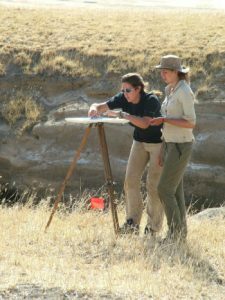 Camilla and Megan Plane Table Surveying around Kerimasi Base Camp. The Young Explorers benefited from using modern sophisticated Leica Geosystems surveying equipment. This was offset by introducing them to Plane Table surveying around the camp to show them the basic principals of making a map and how errors were easily made if care was not taken with setting up and orientation. The BES expedition to Tanzania was an opportunity to bring awareness of Surveying (Geomatics) to young people starting out in life and into their schools as many of the Young Explorers are now back at school completing their final year before going on to University. This type of activity, together with innovations such as Geomatics.org, which makes Surveying equipment, such as Leica levels, available to Schools and to BES Expeditions during the summer months, will bring our profession to the attention of young minds. This safari will be deeply embedded in the minds and remembered fondly, by those that took part, for the rest of their lives.